What Are the Edible Native Plants of Ohio? The chances of your ever having to live off your Ohio land in the same way the state's early settlers did are slim. As an Ohio gardener, however, you might be interested to learn how many of Ohio's native plants are nutritious and tasty food sources. They range from the obvious, like wild berry bushes and nut-bearing trees, to the surprising, like common weeds. Adding of few of them to your Ohio garden may lead to some interesting dinner conversations. Grayleaf red raspberry (Rubus idaeus) is a member of the rose family that grows wild in Ohio's woodland bogs and clearings. Reaching up to 6 feet tall with a spread of twice that, this raspberry has arching, thorny, reddish branches and clear green summer foliage that darkens to purple in autumn. Loose clusters of small, flat-petaled white flowers appear between May and July. The berries, ripening from pinkish-green to red, arrive in August. A favorite food of numerous birds and mammals, they are edible right off the bushes. They also freeze well, making excellent reserves or pies. 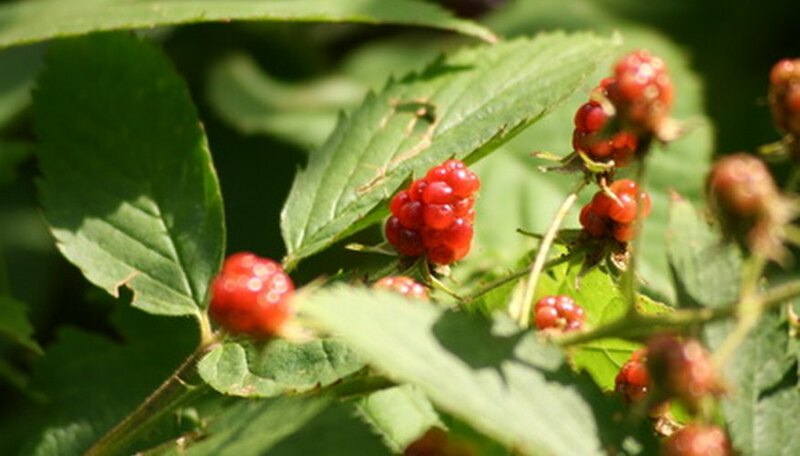 Grayleaf red raspberry grows in sun or shade and moist or dry soil that's on the acidic side. It naturalizes readily, so plant it where it won't be invasive. Another member of the rose family, Allegheny service berry tree grows between 15 and 25 feet. Its dense branches produce attractive clusters of white flowers before they leaf out. The tree's edible berries appear in summer, changing from red to black as they become riper and sweeter. Leaves that change from summer green to autumn red contrast attractively with the berries. The tree's white-striped gray bark adds ornamental interest. Dried berries are similar to raisins. Native Americans used them to sweeten pemmican, a dried mixture of meat and fat. Birds flock to the berries on the wild trees in Ohio's forest and clearings and along its wetland edges. Plant it in loamy, moist soil in sun or shade. Named for its bitter white sap--the only food for Monarch butterfly larvae--, common milkweed (Asclepias syriaca) grows in sunny areas along Ohio's roadsides and in open fields. Straight-stemmed common milkweed grows between 2 and 6 feet, with 8-inch oval green leaves. From early to mid-summer, the plants bear attractive 4-inch clusters or fragrant pink to purple flowers. In early fall, common milkweed's gourd-like green seedpods burst to release seeds. They're attached to silken fibers that let them disperse on the wind. Unchecked milkweed can spread over large areas. The plant's sap is toxic when consumed in large quantities. With proper preparation, however, its spring leaves and shoots, young seedpods and flower buds are edible. Boil the spring leaves and shoots (scrape the fuzz from the shoots first) for three minutes. Then place them in clean, boiling water and repeat. Do this tree times, then continue to boil them for 15 minutes. Flower buds boiled for one minute and battered can go in the deep fryer. Boil the young seedpods for several minutes in water with baking soda to soften their fiber. Roll the softened pods in cornmeal and fry them for an okra-like vegetable.